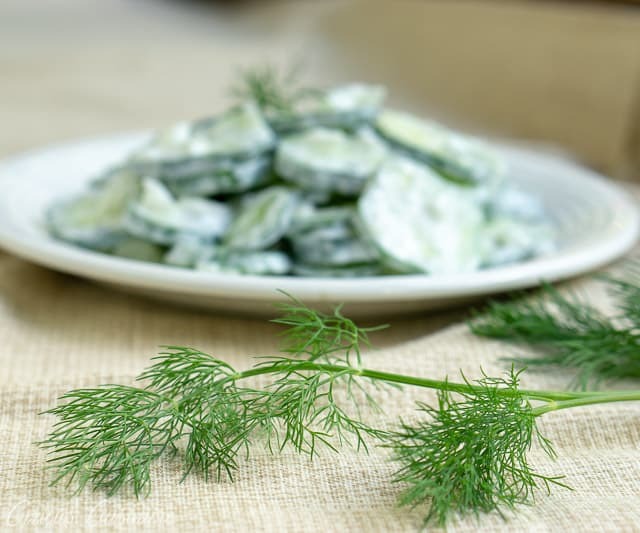 Gurkensalat is a simple cucumber salad with dill that is light and refreshing. This German Cucumber Salad is just creamy enough to complement the crisp summer cucumbers without being overly heavy. 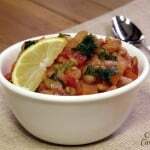 It’s the perfect easy recipe for your summer cookout or pot-luck dinner. 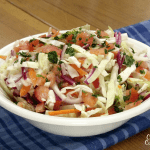 Gurkensalat: Creamy Cucumber Salad or Not? German grandmothers have been making Gurkensalat salads for ages. And, honestly, no grandmother makes their cucumber salad the same way. 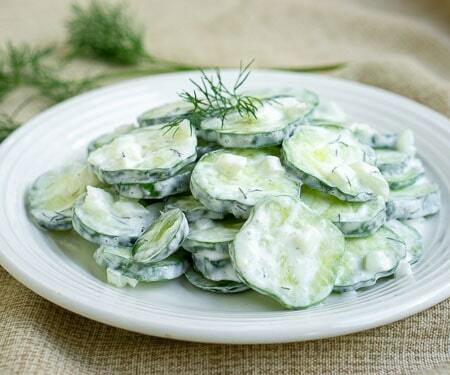 You will find creamy and non-creamy versions of this German cucumber salad. 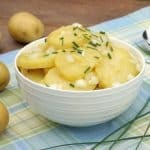 The version were’re sharing with you today is for a German style creamy cucumber salad. But, if you prefer a vinegar cucumber salad that is not creamy, you’re in luck, because some Germans do too. 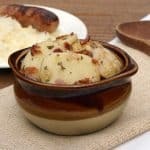 You can omit the sour cream in our recipe below and increase the vinegar to ¼ c and add 1 Tbsp of some neutral flavored oil (like canola or lite tasting olive oil). It’s that simple. 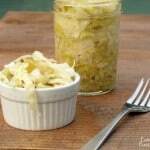 And you still have a tasty German style cucumber salad. Can I Make Cucumber Salad Ahead Of Time? 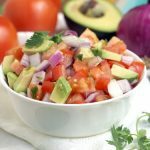 Some recipes recommend letting this salad set for a few hours in the refrigerator for it to develop its flavor. We prefer to let the dressing develop its flavor off of the cucumbers because, once you add the dressing to the cucumbers they start to release moisture and the dressing gets a bit watery. The slightly watery dressing really isn’t the end of the world, but, we do like the way the salad tastes just mixed. As the cucumbers release their moisture, you may find that there are a few bubbles in your salad as well. Don’t worry, that is totally normal. How you slice the cucumbers for your cucumber salad is really up to you. Many traditional versions will slice the cucumbers very thin. After a little soak in the dressing, the thin slices really become infused with the flavors of the dressing. Other versions slice their cucumbers a bit thicker. Slicing them thicker keeps a bit of a crunch in the cucumber and creates more of a contrast between the crisp cucumber and the creamy dressing. Personally, we like the way the crunch of the slightly thicker slices of cucumbers contrasts the smooth and creamy dressing. But, either way is delicious. Try it both ways and see which one you like better! To Salt The Cucumbers Or Not? When working with cucumbers, you’ll often see instructions to salt the cucumbers and let them rest for 30 minutes or so before rinsing them, patting them dry, and finally using them in your dish. 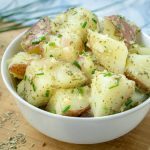 This salting helps to pull some of the moisture from the cucumbers, leaving them more crisp in your dish, and helping your dish to not get too watery. While we like salting our cucumbers when we’re doing a vinegar dressing, when using a sour cream based dressing, we found that salting the cucumbers first gave us a bit of an interesting reaction in our salad when we mixed it. Now, when you mix the salad together without salting the cucumbers, you will eventually start to get a few bubbles as the cucumbers release their moisture. But, not as many bubbles. Which Cucumbers Are Best To Use For Cucumber Salad? If you’re making a cucumber salad, seedless cucumbers, or cucumbers with small seeds, like English cucumbers, should be your first choice. The area around the seeds is softer and contains the highest concentration of moisture in the cucumber. So, seedless cucumbers (or cucumbers with small seeds) have less moisture. Using cucumbers with less moisture to start with, will mean that there is less water for them to release in your salad. So as it sets, your salad will stay more creamy, and more similar to the way it was when you first mixed it. 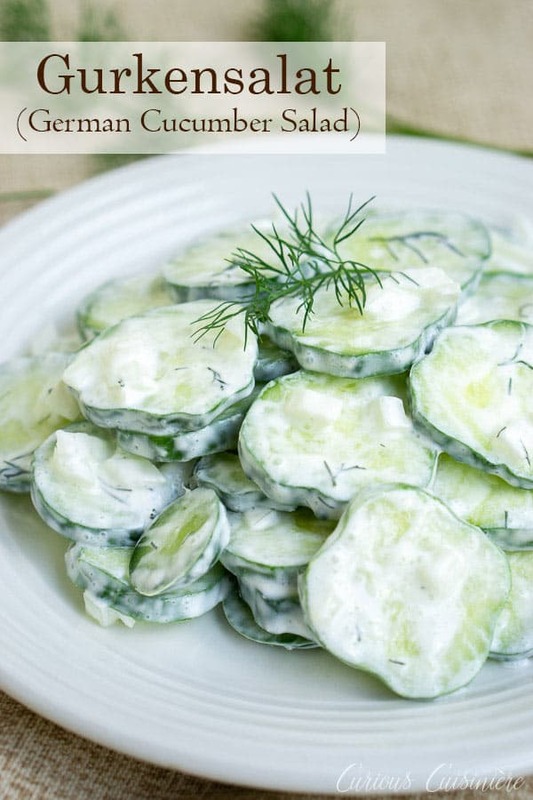 Gurkensalat is a simple cucumber salad with dill that is light and refreshing. This German Cucumber Salad is just creamy enough to complement the crisp summer cucumbers without being overly heavy. Place the sliced cucumbers and onions in a medium bowl. Spoon the dressing over the cucumbers and onions. Mix gently. *If you would like to prepare your cucumber salad ahead of time make it up to this point and refrigerate the dressing separate from the chopped veggies. This will let the flavors of the dressing come together without letting the salad start to get watery. Mix the salad just before serving. 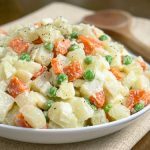 If you prefer a non-creamy version of this German cucumber salad omit the sour cream, increase the vinegar to ¼ c, and add 1 Tbsp of some neutral flavored oil (like canola or lite tasting olive oil). Enjoy!